The majority of consumers want to use biometrics as authentication when paying for things, according to a new piece of research from Visa. The study which questioned over 14,000 consumers across Europe (including the UK) found that two-thirds wished to use biometrics for validating payments. And 73% viewed two-factor authentication in which a biometric is employed as one of the authentication measures as a secure way to make a payment. Common biometric measures include fingerprint scanning and iris scanning, with both these being viewed as the most secure methods of authentication by 81% and 76% of respondents respectively. 53% of those surveyed said they would prefer fingerprint recognition over other forms of biometrics, and 73% said they felt just as at home with fingerprint authentication compared to the traditional PIN. As for the least popular forms of biometrics for payments, those were facial and voice recognition at 15% and 12% respectively. Half of respondents felt that biometrics would make paying for things faster and easier. Jonathan Vaux, Executive Director of Innovation Partnerships at Visa Europe, commented: "One of the challenges for biometrics is scenarios in which it is the only form of authentication. It could result in a false positive or false negative because, unlike a PIN which is entered either correctly or incorrectly, biometrics are not a binary measurement but are based on the probability of a match. 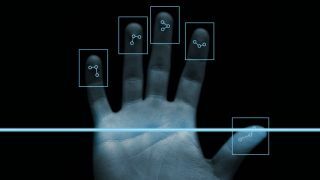 "Biometrics work best when linked to other factors, such as the device, geolocation technologies or with an additional authentication method."